Movie poster of award-winning feature documentary, dedicated in commemoration of the Order’s 800th anniversary. The International Independent Film Awards awarded three awards to a feature documentary, written, produced and directed by Armando P. Ibanez, O.P., a friar of the Southern Dominican Province and who also serves as Assistant Professor, Director of Radio-Television-Film at Texas A&M University-Kingsville. The ﬁlm—dedicated in commemoration of the Order’s 800th anniversary—received three Gold Awards in Directing, Documentary Feature and Animated Visuals categories. In addition, Los Angeles CineFest selected the documentary as an Ofﬁcial Selection, and is now in competition with seven other selected ﬁlms in the feature documentary category, which will be decided later this month. The International Independent Film Awards is dedicated to showcasing and celebrating the many talented independent ﬁlmmakers and artists from around the world who share their visions in a powerful, creative and entertaining way. Fr. 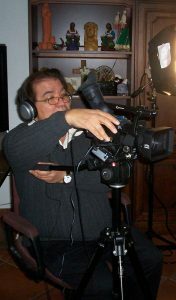 Armando P. Ibañez, O.P., prepares his camera before conducting an interview for another documentary he is producing. The documentary is produced by Pluma Pictures, Inc., a non-proﬁt ﬁlm production company, and by Prospect House Entertainment. 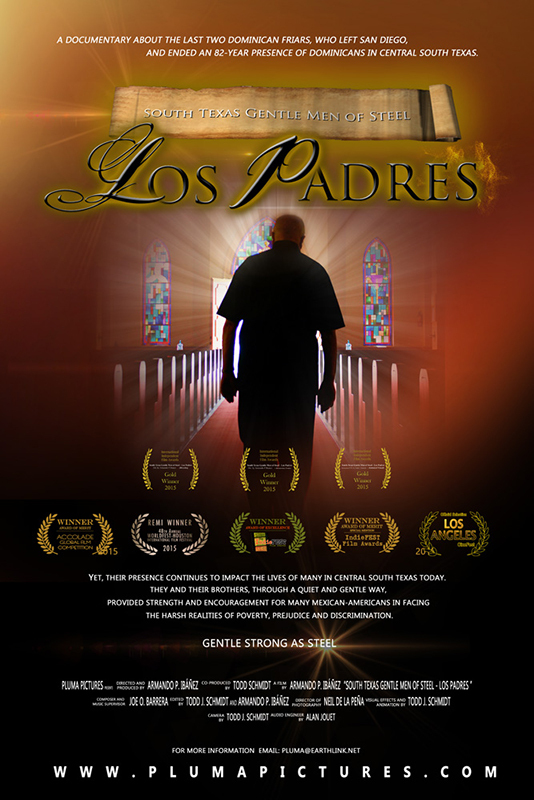 The ﬁlm is about the great impact Dominican friars, headquartered in San Diego, Texas, had on the history and development of central South Texas, especially on how their presence assisted many Mexican-Americans struggle against injustice and harsh racism, especially in Alice and other surrounding communities, which bespeaks of the experiences of many Latinos in the Southwest. “These honors are a testament to a great crew,” Ibanez added. Emmy Award nominee, Joe O. Barrera, a native of San Diego, is the documentary’s music composer and music supervisor. Barrera was named by the Hollywood Reporter as a ﬁlm music composer to watch, and has won numerous prestigious honors for his music. Todd Schmidt, is the documentary’s co-producer and visual effects artist, Neil de la Peña, Director of Photography, and Alan Jouet, audio engineer. “A unique component of our ﬁlm is poetry,” says Ibañez, who is listed in the Dictionary of Literary Biography, and wrote poetry for the documentary. The documentary, which was completed earlier this year, has also won three prestigious awards: Award of Merit, Feature Documentary, The Accolade Global Film Competition, Award of Excellence, Feature Documentary, and Award of Merit Special Mention, The IndieFEST Film Awards. Also, WorldFest-Houston International Film & Video Festival honored the doc with a Gold Remi Award. Pluma Pictures, Inc., board of directors are Dr. Thomas M. Hedberg, vice president, fr. Christopher Renz, O.P., Secretary, Ned Greene, Treasurer, fr Bruce Schultz, O.P., Dr. James Moises, Laurie Scheer, Michael Paz, and Dr. Erlinda Grey.